Was Hemingway pulling our leg, or was he fooling himself? I began to wonder whether the Gran Maestro character was humoring The Supreme Commander the way one might humor a lovable person who is off his rocker. This could be possible without the Supreme Commander ever realizing it. The Maitre d’Hotel would simply be doing his job in taking care of an eccentric, loyal guest. Finally we meet the Colonel’s inamorata, Renata, at Harry’s Bar. She is a contessa, age eighteen. The wise, hardscrabble Colonel Cantwell is fifty-one. He has an undefined heart condition for which he is popping mannitol hexanitrate tablets that he routinely washes down with Gordon’s Gin and Valpolicella. The Colonel and the contessa are in love. We never learn how they became involved. Renata idolizes the Colonel. He in turn has a goddess fixation on Renata. They spend their time between the Gritti and Harry’s Bar. The plot device is somewhat similar to that of The Snows of Kilimanjaro, the masterpiece Hemingway wrote for Esquire in 1936. The hero is dying. In Kilimanjaro, that is clear from the start. In Across the River, it dawns on you halfway through. There are hints, but only in passing. Then it hits you right in the gut. “Richard,” Renata interrupts him on her second visit to his room at the Gritti, “don’t lie to me, please, darling, when we have so little time.” And next, “Don’t you know I want you to die with the grace of a happy death?” What? Does the Gran Maestro know about this as well? It is news to the reader. As in Kilimanjaro, the embittered protagonist dredges up everything from the past and nails it down. Here, Cantwell does the same for Renata, obsessively focusing upon both World Wars and himself. It goes on and on until you want to scream. Some of it is incomprehensible. Other parts seem inconsequential. If the Colonel asks the contessa once, he must ask her a dozen times, “Am I boring you, daughter?” No girl is going to sit there and listen to an older man sound off nonstop on masculine topics such as war. The fictional relationship in the novel was based upon a real-life infatuation Hemingway had in Venice. For this reason, Hemingway had publication in Italy blocked for two years. In the novel, Hemingway is projecting for himself a best-case, idealized scenario of this unrequited infatuation. Nothing came of it. I had a brief encounter with Ernest’s younger brother Leicester in the 1970s. It was on a seaplane from Miami to Bimini. Leicester was 16 years younger than Ernest. He looked startlingly like Ernest did in the 1950s. He even acted like Ernest would have acted and talked the way he would have talked. Leicester shot himself in 1982, just like Ernest did in 1961. Their father shot himself in 1928. In Leicester’s case, the reason was diabetes. He could not stand the operations. Ernest found himself trapped with high blood pressure and an unbalanced mind, aggravated by shock treatments. No matter how good or interesting your circumstances may be, it is going to end badly. 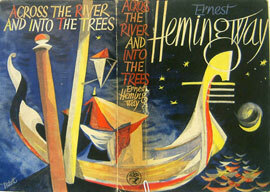 That is Hemingway’s enduring message, it seems to me, contained in Across the River and Into the Trees.